الخيار الأفضل للحصول على المتعة والاسترخاء, Mercure Kingfisher Bay Resort يقع في منطقة جزيرة فرازر في خليج هيرفى. يمكن من هنا للضيوف الاستمتاع بسهولة الوصول إلى كل ما تقدمه هذه المدينة النابضة بالحياة. يوفر الفندق بفضل موقعة الجيد وصولاً سهلاً إلى أهم معالم المدينة.
. ببساطة كل الخدمات وأساليب الضيافة التي تشتهر بها Accor Hotels تجعلك تشعر وكأنك في بيتك. يمكن الاستمتاع بمجموعة من الخدمات على أعلى المستويات في الفندق كمثل مكتب الاستقبال على مدار الساعة, تخزين الأمتعة, صف السيارات, التوصيل من وإلى المطار, رعاية أطفال. في الفندق غرف نوم يتجاوز عددها 156، كلها مجهزة بعناية وجمال وبعضها مزود بـ اتصال لاسلكي بالإنترنت, غرف لغير المدخنين, مكيف هواء, تدفئة, خدمة الإيقاظ. يقدم الفندق العديد من الفرص للاستجمام كمثل حمام سباحة خارجي, ملعب تنس, بلياردو. اكتشف مزيجاً ساحراً من الخدمة الاحترافية والخيارات الواسعة من وسائل الراحة والمتعة في Mercure Kingfisher Bay Resort. Just perfect after 5 nights camping! We really relaxed here before heading over to Hervey Bay. Fraser Island has always had a soft spot in our hearts and this visit was like no other. A wedding held at the Resort was absolutely beautiful and our adventures around Fraser was magical as always. The accommodation is getting old with painting and fixtures needing to be updated. Otherwise a great family time away. There were roaches everywhere and the reception staff was not very pleasant. Wanted me to pay with my credit card as it was easier for her even when I didn't want to with the surcharge. Everything about this hotel says you have to pay extra and priced aren’t cheap! Restaurant food is expensive and just for a basic burger is about $15 and wasn’t good either! Pool size was good and clean. Rooms were good sized and good bathroom with hot water. Our door wasn’t very secure and had to be relocated after 3 maintenance guys couldn’t fix it and we complained . White high orice just for the room itself . Under the condition that hotels are limited in Fraser Island, this hotel was reasonable except for that a flush of toilet was very weak and Wifi was charged though a reception of mobile was so bad in the island. Check in is at 2pm but we didnt get our room until nearly 3pm and since we had our bags with us we had to stay around reception until it was ready. When it was ready we were given the card and that was it. We wernt told where our room was, where breakfast was and what time breakfast was. Had to BUY wifi but it didnt work in our room as we were put towards the end of the hotel rooms where there is no reception. The meals in the restaurant are completly overpriced for what you get. The rooms are okay but you can see its tired. Needs to be refurbished. We enjoyed the day tour and liked the setting outdoors but were disappointed with the rest. Totally overpriced! me and my friends stay two night, and we both bite by small bugs all around the body, small red swollen on the legs and arms and bodies, we both unhappy and feel so disappointing with this experiences, never do this again next time. Location - has direct ferry access. It's on the Island. Some tours available. Was disappointed: believe this hotel would have been exceptional when first opened some time ago, but a number of small things made it less than appealing. No room service and limited restaurants for walk-in's. Many tours, etc booked up. Hard to get pool towels and access to some parts of the resort. Couldn't pay bill in advance because of the "system". Cleanliness of rooms ok, but front desk area not to standard expected. Staff generally friendly but not enough of them. Good service, beautiful view and great food! This resort has gone down in quality compared to our previous visits ( 3 previous of, over 15 years ) it is starting to look dated and needs a good going through,our room was very dark, as this was a off season visit some of the staff seemed more interested in their own leisure time than that of the guests and when off duty hung around the bar and pool. most staff seemed to be temporary and were on minimum wage and accommodation. food was very good but limited to the same few items and expensive, after 4 days you would have to restart the menu. had a really amazing stay here. a great starting point for exploring the wonderful fraser island. s much to see and do. the hotel could do with a freshen up but as there isn't much choice on the island we were more than happy. fraser island is all about getting out and exploring so we didn't spend much time in the hotel anyway! 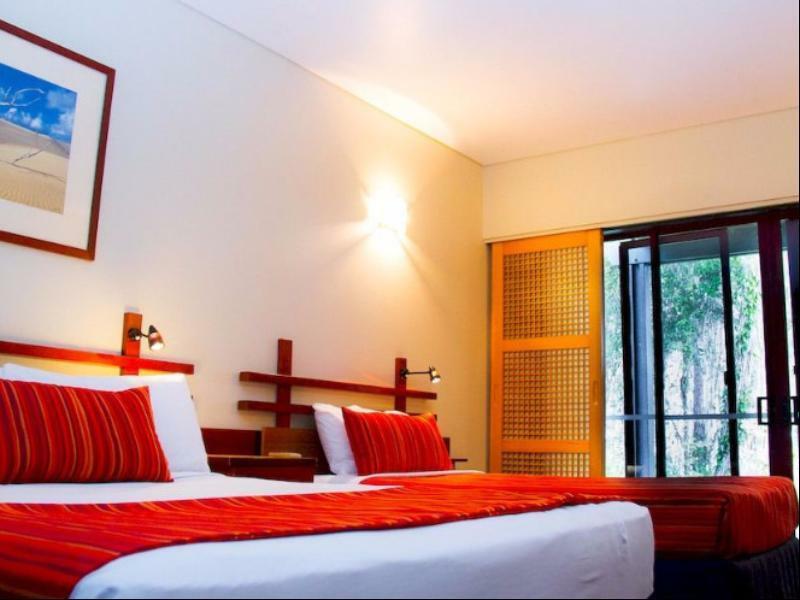 Fraser Island does not have many options, so it is almost an exclusive hotel. The location is on the wrong beach, which means that you will have to drive inland on very soft sand to go anywhere. Driving inland is something most people would minimise. Service is average as they know that you have very few options. It's a nice hotel, maybe the best inside the island, but it was raining one day of my trip and the hotel doesn't have a nice service and infrastructure for the bad weather. 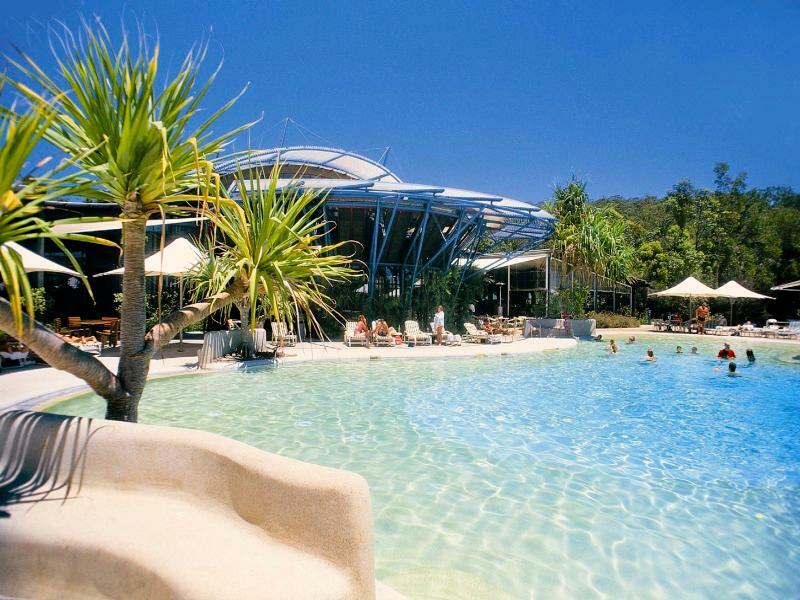 This resort on Fraser Island has very good facilities as accomadations are limited.Price was quite reasonable.It was pouring rain when we were there so didn't get to use the pools or beach but looked good. Various meal options at 3 different spots.The road getting into the resort was very chewed up you can arrive by ferry right to this resort but then have to travel out the road to access Island.